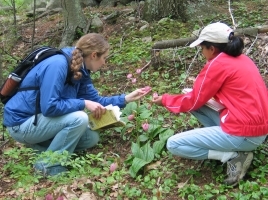 Explore the many great phenology-related observation programs and organizations. The AAVSO is an international non-profit organization of variable star observers whose mission is to observe and analyze variable stars, to collect and archive observations for worldwide access, to forge strong collaborations between amateur and professional astronomers, and to promote scientific research and education using variable star data. The American Assocaition of Variable Star Observers (AAVSO) is a non-profit worldwide scientific and educational organization of amateur and professional astronomers who are interested in stars that change in brightness, variable stars. DroughtWatch is a web-based monitoring program designed to collect, summarize and display timely observations of drought impacts across Arizona. The Bee Forage Network is a free service that graphically presents local blooming conditions of bee-friendly plants based on reports submitted by volunteer observers in Vermont. This project is a scientific study to understand the impact of climate change and other factors on plant-pollinator interactions, geographic distributions, and seasonal abundances. Over 70 transects are monitored in Ohio each year. Rural Action will create one transect in northern Athens County in 2011 to add to this monitoring effort. California NatureMapping is starting up through individual Centers that are trained and supported by the National NatureMapping Program. The goals are the same to link natural resource agencies with citizens and schools through biodiversity data collection and analyses. Currently, K-12 students are the main focus for NatureMapping training and local research projects. These projects include inventorying and monitoring wildlife through the Fresno County Schools and bioblitzes and tracking in the Bay area. The California Phenology Project (CPP) was launched in 2010 to develop and test phenological monitoring protocols and to create tools and infrastructure to support long-term phenological monitoring and public education activities in California. A primary focus of the effort is to recruit, to train, and to engage California residents, outdoor educators, and national park staff and visitors in the collection and interpretation of phenological data. The CPP initially focused on 30 plant species in seven national parks in California, encompassing desert, coastal and mountain biomes, and building upon existing monitoring protocols and programs of project collaborators. In addition, new project products and infrastructure are being designed to support monitoring and educational activities for 18 California NPS units and parks in adjacent states. To date, >770,000 phenological observations have been uploaded into Nature's Notebook by CPP participants. Learn which species are being targeted by the CPP and download maps of CPP plant locations, species profiles, data sheets, and lesson plans and activities for phenological education from the CPP website. The CLLS is a long-term project designed to monitor the breeding success of loons on lakes across Canada. Our goal is to help conserve loons by increasing our understanding of loons and of human impact on them. Our success in achieving these goals depends entirely upon the work of volunteer surveyors. Le CLLS est un projet š long terme conu pour surveiller le succs de multiplication des loons sur des lacs š travers le Canada. Notre but est d'aider š conserver des loons en augmentant notre arrangement des loons et d'impact humain sur eux. Notre succs en r_alisant ces buts d_pend entirement du travail des arpenteurs volontaires. The Cape Cod National Seashore Phenology Monitoring Program started making field observations in 2012. Trained volunteers supported by the Atlantic Research and Learning Center of the Cape Cod National Seashore monitor a variety of field sites ranging throughout the Seashore. Please visit our website to learn more about the program and to learn about becoming a trained volunteer. Celebrate Urban Birds is a bilingual citizen science project from the Cornell Lab of Ornithology. Participants learn about 16 focal species of birds, collect data, and report information about their habitat. Scientists at the Cornell Lab analyze the data to better understand which types of spaces are more likely to be used by different kinds of birds. Celebrate Urban Birds engages participants through the arts, community involvement, habitat improvement, and health initiatives. Participants learn about habitat, birds, and create or improve green spaces in their communities. EcoSpark's Changing Currents program introduces grade 8-12 students from across the Greater Toronto Area (Toronto, Peel, Durham, and York school boards) to their area's watersheds. Students get outside, put on hip waders, explore a local river stream, and learn about its importance and quality. By participating in the program students will: use benthic macro-invertebrate bio-monitoring to examine the health of their local river or stream (it's easy! ), contribute to a GTA-wide study of watersheds, and have the chance to take action around what they discover. Channel Islands Naturalist Corps volunteers are specially trained by NOAA Channel Islands National Marine Sanctuary and Channel Islands National Park to collect opportunistic marine mammals sightings in the Santa Barbara Channel on participating whale watch and tour vessel operators. Marine mammal sightings date back as far as 1999 and are accessible on the Web to the public, scientists, and resource protection managers. Channel Islands Naturalist Corps volunteers are also specially trained to assist with photo-ID of blue and humpback whales for Cascadia Research Collective and orca whales for the Los Angeles American Cetacean Society. Citizen Sky is a citizen science project providing you with a chance to do real scientific research. The project involves observing a very bright star with the naked eye. But it also involves analyzing data submitted by others and working in teams to do research and even write papers for publication in a peer-reviewed astronomy journal. Australia-based program to understand the effects of climate change on Earth's natural processes. The information you collect and enter online from across Australia will be used to assist scientists, policy makers and land managers and take appropriate measures to deal with the impact of climate change. Do you know of a phenology-related program that should be on the list?